Well, I know which one I'd choose. Unfortunately my genie isn't talking to me any more after I put his bottle in the dishwasher. 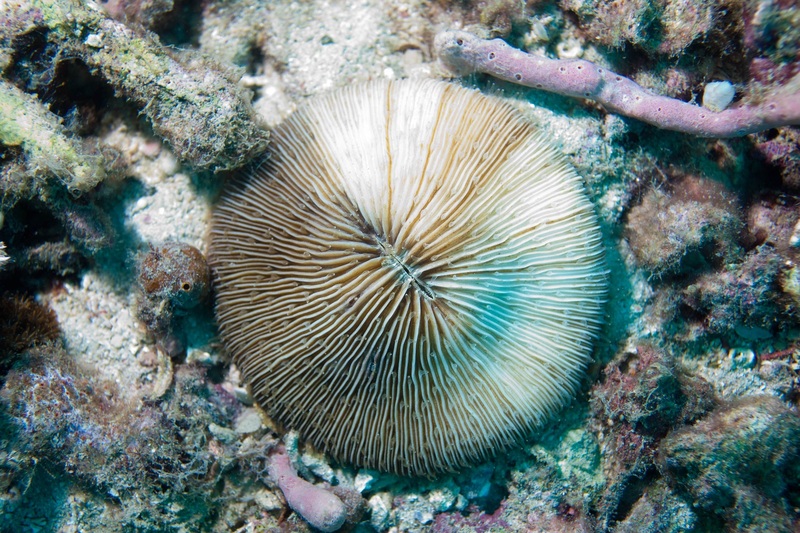 Luckily, it turns out corals in the shape of a mushroom are actually really strange corals! We're looking at the species that make up the suitably mushroomy-sounding family, Fungiidae. It's not a big family with not many more than 50 species, most of them residing in the Indo-Pacific region. Australia is quite the haven for them, though some are also found along the eastern coast of Africa and a few extend all the way out west to the Caribbean. But what, you might ask, is so weird about them? Well, let's consider a normal coral. Specifically a stony coral, since these Mushrooms belong to that particular group. 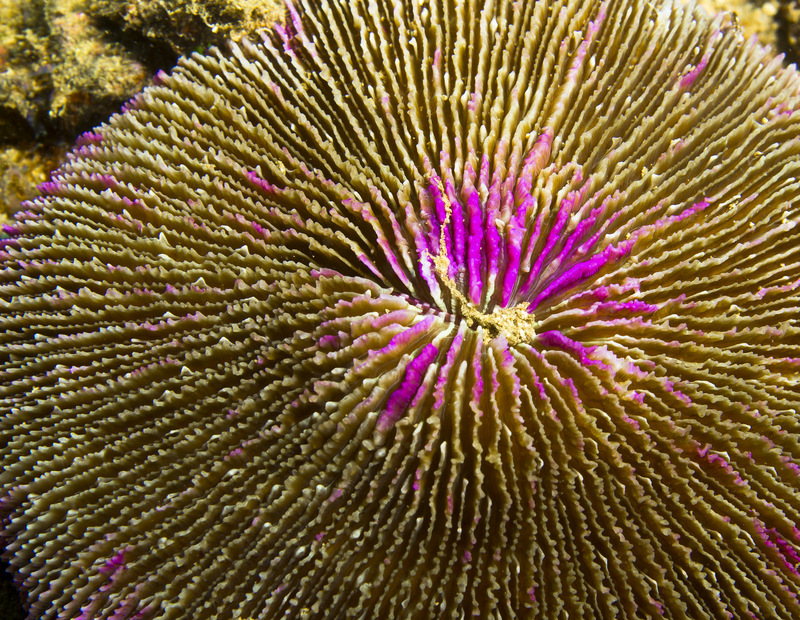 Your usual stony coral is a colony - often quite a large colony - composed of lots of tiny clones known as polyps. Each polyp has a collection of tentacles for catching tiny food and a tiny mouth for eating it. The polyps each construct a kind of tough, stony cup to reside in. It's called a corallite, and polyps can retreat into them during the day or whenever predators are eyeing those tasty, tasty, squirmy, wormy tentacles. These corallites are stuck together to form the shape and structure of the coral and it's often the only thing we can actually see when the polyps who made them are in hiding. And if the corallites are tough enough, these stony skeletons form coral reefs. Mushroom Corals? They're a little different. Most of them aren't colonies of polyps. They're composed of one, gigantic, mega-polyp! This one polyp still constructs a corallite to live in, it just happens to be utterly enormous. The smaller species might be a mere 10 cm (4 in) across. The biggest can reach closer to 60 cm (2 ft)! 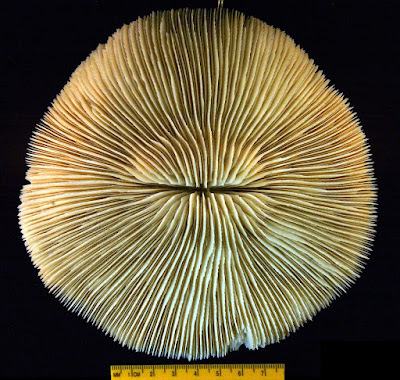 Some Mushroom Corals are perfectly round or somewhat oval and bear a single, slit of a mouth right in the middle. Others are long and narrow and bear numerous, small mouths running all the way down the middle like a hungry hair parting. 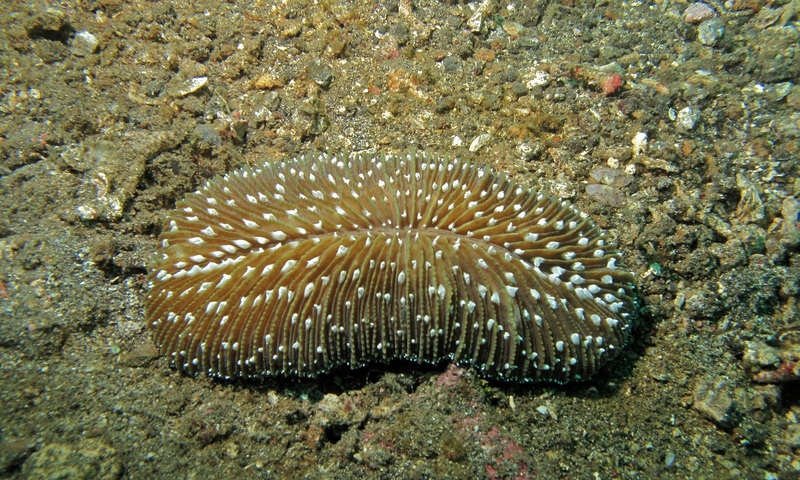 They look a lot like Sea Cucumbers, unless they get injured and the regrowth goes funny so they end up Y or T-shaped. 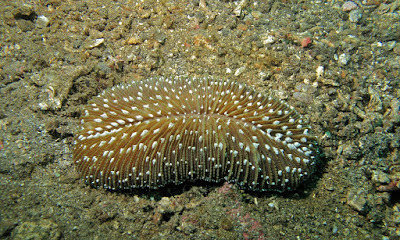 Yet other Mushroom Corals have mouths dotted all over the surface, either randomly or in some kind of pattern. 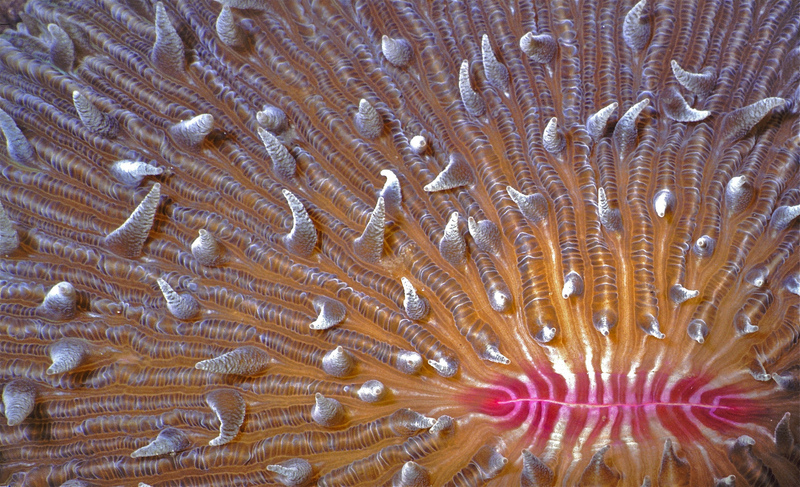 There are Mushroom Corals who are clearly one, big polyp with one, big mouth. There are others who are clearly colonies of smaller polyps, each boasting their very own mouth. But in between are some who might be best thought of as one, big polyp with lots of little mouths. Mushroom Corals are really good at blurring boundaries. And then there are the tentacles. 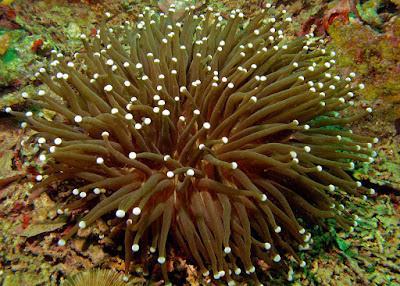 Most Mushrooms Corals have a nice collection of fairly short, fairly sparse tentacles which emerge all over the polyp. 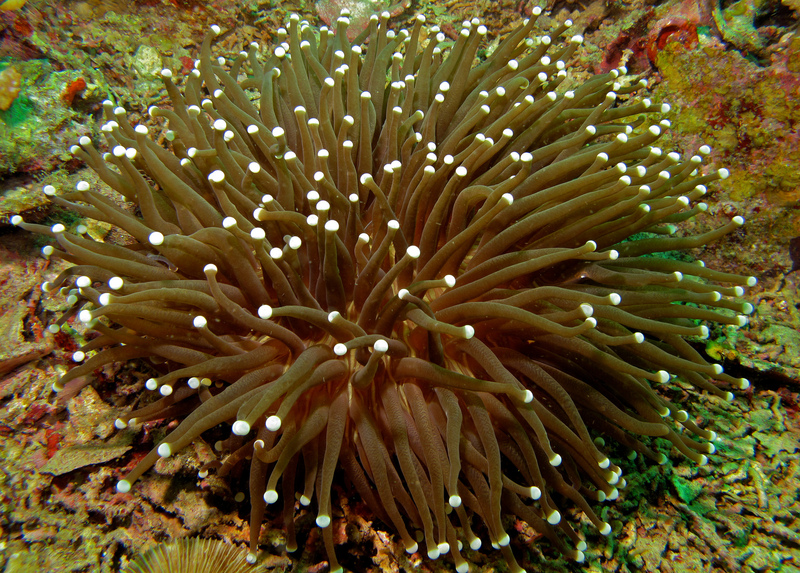 However, one particular species, Heliofungia actiniformis, is endowed with such a full covering of luxuriously long tentacles they end up looking just like Sea Anemones! They're also packed full of zooxanthellae, which are tiny, symbiotic organisms that provide the coral with food via photosynthesis. 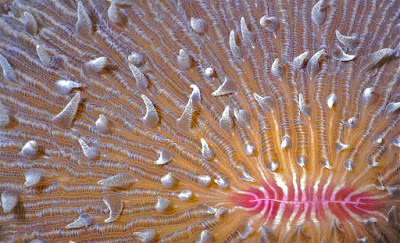 This is a common thing among corals and sea anemones, but symbiotic micro-organisms is surely another blurring of the boundaries the Mushroom Coral simply couldn't resist! But you can't expect a mega-polyp to be satisfied by a bunch of microscopic hitch-hikers! Mushroom Corals will also catch their own food with their tentacles. Sometimes it's just teeny worms and stuff, but they can also catch juicy jellyfish and savoury salps. Sure, it's soft food that's like 99% water, but it's impressive dining for a coral. 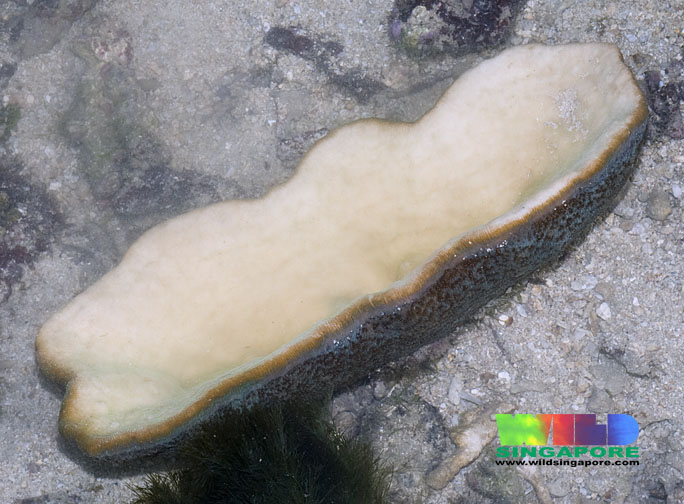 One Mushroom Coral was even spotted with a sea slug disappearing into its toothless maw! 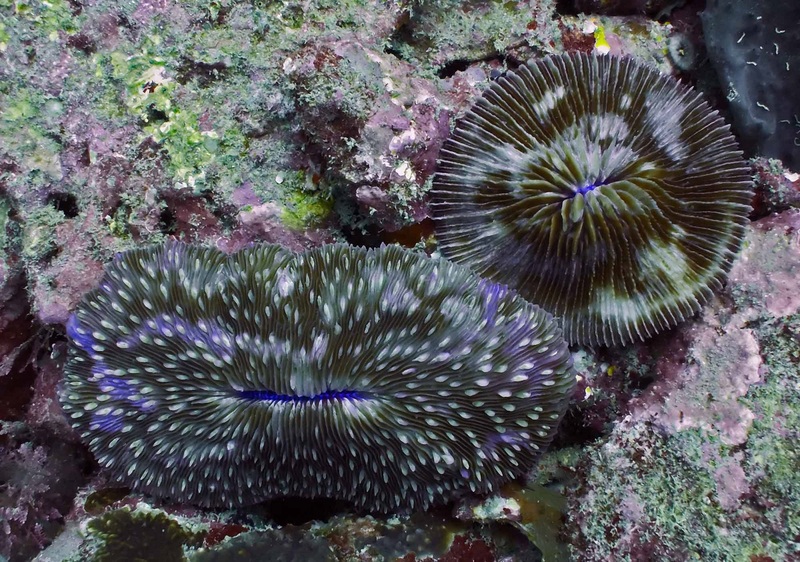 Another peculiar thing about Mushroom Corals is the fact that they can move. You see, Mushroom Corals have a problem. 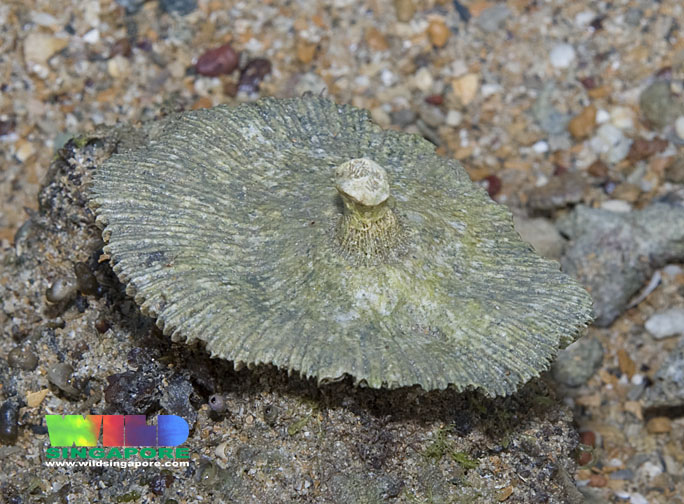 While they're more or less dome-shaped, they still tend to be quite flat, and that can prove problematic if they find themselves on the silty, sandy seabed where currents can bury them in silt and sand. Why, pulsate, of course! A buried Mushroom Coral throbs and heaves, expands and deflates, slowly shoving sand aside as it emerges from the sea floor like a bad memory in a troubled mind. But they go even further. While corals typically spend their entire lives stuck fast to the ground, most Mushroom Corals are actually free-living and not at all sedentary. They can actually walk around on the sea floor like a great, big slug! A very slow slug. Even other slugs would say that. 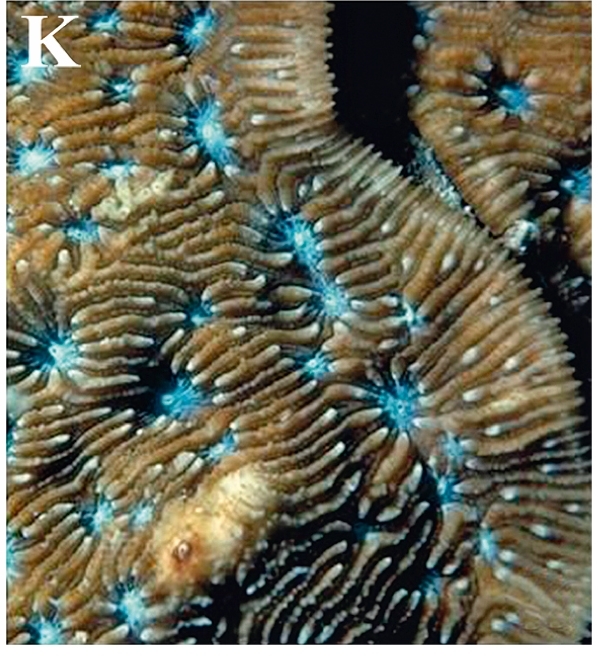 But for corals, the ability to "get around" at all is basically a superpower. Not all Mushroom Corals can do it. Some are permanently attached to rocks or the skeletal remains of dead corals. They have the same domed shape as other Mushrooms, but there's a little stalk on their underside which acts as an attachment point. 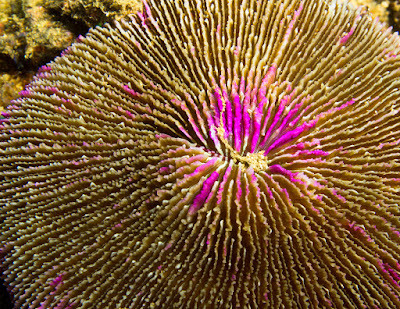 This at last is the mushroominess of the Mushroom Coral. In fact, ALL Mushrooms Corals are like this when they're young. It's just that most of them lose the stalk and become detached as they mature. So if you ask me, it's not so much a Mushroom Coral as a Mushroom-Sea Cucumber-Sea Anemone-Slug Coral. They are corals of many facets. And you can't even be sure if each facet has it's own mouth of if they all share one, big one. I have never seen a coral try so hard not to be a coral! @TexWisGirl: Those genies are a finicky bunch! @Esther: And they're so good at it, too!